Just yesterday, I couldn’t finish a 6GB transfer to my Seagate Central NAS because my wireless connection kept dropping. Found out that this is a common problem for the D-Link DIR-615 router. Only solution would be to update the firmware to DD-WRT. So upgrade I did. These are the steps I took to complete the upgrade. 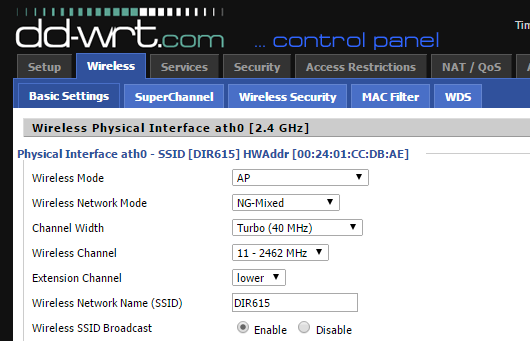 Searched on the DD-WRT database if there was an update for my router, fortunately there was (revision C2). The row doesn’t look like its an active link but just clicked on it and this is what showed up. Then proceeded to download both firmware binaries. 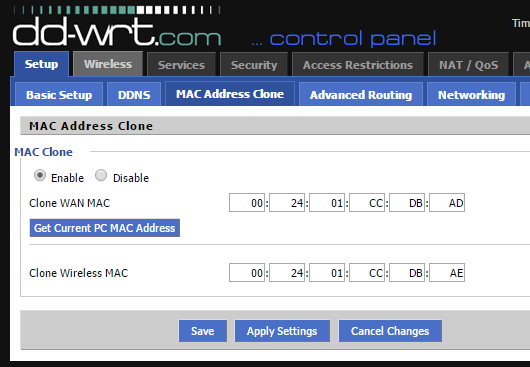 The first image is to flash DIR-615 to DD-WRT, the second image is to upgrade the DD-WRT firmware. Connected D-Link DIR-615 directly to my computer via ethernet. Logged in to D-Link’s web interface. Under Tools -> Firmware, I uploaded the first image, dir615c1-factory-to-ddwrt-firmware.bin. Then hit the upload button. Waited for a couple of minutes then the router became unreachable. Normal under these conditions since my D-Link router was configured to be accessed at this IP address, 192.168.0.1, after the DD-WRT firmware install, ip address defaults to 192.168.1.1. Logged in to the web interface. 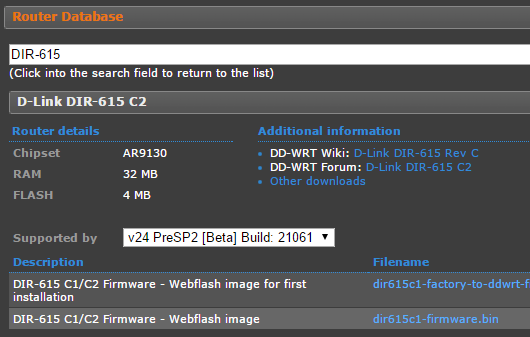 Then went ahead and upgraded the firmware with the second image, dir615c1-firmware.bin. Found it via Administration Tab -> Firmware Upgrade. After the reboot, wireless radio was off. For some quirky reason, I had to enable clone mac to get the radio on. Then I used the following configuration for my Wireless network. A couple of notes, throughout all the process I used the Firefox browser. I didn’t do any hex edits or did a any configuration reset. Already threw around 50GB worth of files big and small and so far WiFi hasn’t dropped yet (crossing my fingers). So I guess I’m keeping this hardware for now, it’s not the fastest but it’s stable enough for my use.